VASETULLE is a gauze of leno weave impregnated with White Soft Paraffin BP. VASETULLE acts as a barrier between the wound and a secondary dressing, Low adherent non-medicated paraffin gauze dressing. Skin loss wounds, lacerations and abrasions. Donor and recipient graft sites. Do not use on more than 10% of the body area. VASETULLE should not be used if the seal or wrapper is broken. VASETULLE is incompatible with soaps, other anionic materials, as well as potassium iodide. The use of VASETULLE with oxidizing wound cleansing agents should be avoided. 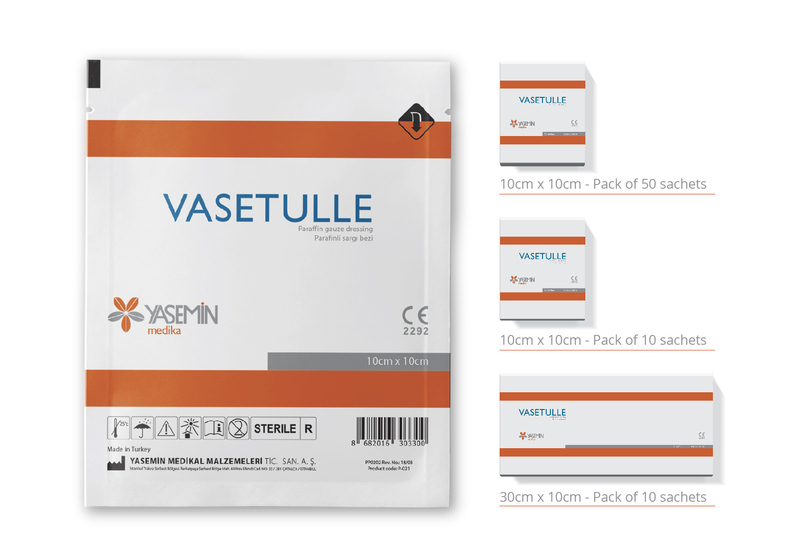 VASETULLE is a single use only product. If used on more than one patient, cross contamination or infection may result. Opening the dressing pack compromises the sterile barrier therefore any unused dressing should not be retained for application later. Cleanse the wound using standard techniques. Select the correct size dressing and peel open the pouch (or tear end from roll pack). Using gloves and forceps, remove protector papers. Lay over wound in a single layer in direct contact with the wound surface. Apply a secondary absorbent dressing if required and secure in place with a dressing retention bandage or dressing fixation sheet. Removal: VASETULLE may be left in place when the absorbent secondary dressing is changed. The frequency of changing will depend on the clinical circumstances and this can vary from more than once a day to twice per week. If the dressing sticks soak it off gently with sterile saline solution.